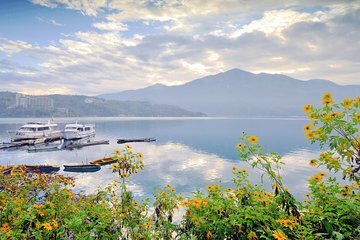 Travel in style through Taiwan and discover top attractions with ease on this private Sun Moon Lake day trip from Taipei. Hop aboard your high-speed bullet train and zoom to Sun Moon Lake with your private guide. Enjoy a private 1.5-hour motorboat cruise on the lake and watch the waters for native birdlife. Visit local landmarks including Hsuan-Kuang Temple and the Ida Thao Village, and learn about the native Thao people. After a traditional lunch, explore the beautiful Tse-En Pagoda and Wenwu Temple by the lakeside. Our tour guide, Michael, was terrific. Very knowledgeable, fluent in English and very accommodating with any physical limitations that we may have had. The tour was VERY expensive and I had assumed that the train would have been booked in business class as it was so expensive, but it wasn't never ASSUME. On the return trip, we missed our train due to unforeseen heavy traffic delays no ones fault and Michael did arrange business class tickets for that portion of the ride. The lake is gorgeous. however, the one and 1/2 hour boat ride was actually about 30 minutes. Lunch was at a restaurant MaGaiDan that was not clean inside and when we asked for an outside table as it was a beautiful day, first we were told there weren't any there were 2 with no one at them and after insisting, they stuck us at one that had a broken floor board beneath one of the chairs and a piece of plastic over the table cloth..the staff were not very nice. The chicken soup was good, the rest of the lunch not so much! The WenWu temple is magnificent, the town with its shops and food stalls is fun. Upon arrival to Lalu Island, you must try the tea eggs, delicious! Again, we loved out guide this was our second tour with him, the trip is definitely a must see, but I do feel it was overpriced for what we got. The bullet train was a fun way to make the trip to Sun Moon Lake. I had never actually been on one, and it is a different experience from a Maglev. I got to enjoy the scenery from the window seat. Sun Moon Lake is very pretty with clear emerald-green water. It is a long day, but was very fun. The temple's artistry is amazing as well. The tour was fantastic. Was given business class train ride to Sun Moon Lake and has the whole boat to ourselves to cruise around then lake. Lunch at the local trip restaurant was delicious. Did not have enough time so miss out some of the tourist spots.. It would have been wonderful to end the trip with a business class train ride back to Taipei. The tour guide Mr Edgar Hu has done a great job. He is knowledgeable, professional and walk the extra miles in providing good and satisfactory service. I would strongly recommend him to any tourist who are looking for quality tour in Taiwan.